Alright guys and gals, I took break from working on the site for a while because I have a life... not a very entertaining one but still a life. But now I'm back and the sites gonna get going again. Card of the week Is going good. Card of the week is a section where a few decent magic players give their respective opinions on some cards. 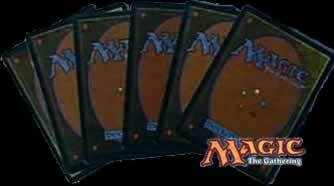 I know you guys are probably tired of all those deck lists that include the power 9 or any of those impossible to get your hands on rares. So here's what I'm gonna try to do, the decks I list will be decks that have won me enough games to call them good, but I'll try not too have any of them with too many rares. If you want to check out some of my decks click on the decks. It's not just me that going to be writing some decks so don't get mad at me if one of the decks you make doesn't work for you.